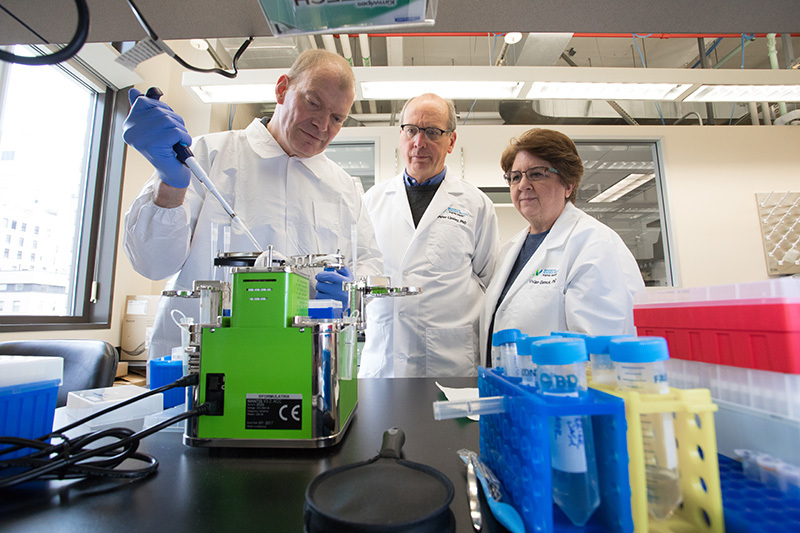 Marty Timour, research technician, Genomics Core; Peter Linsley, PhD; and Vivian Gersuk, PhD; observe the Mantis robot, which makes single-cell analysis fast, accurate and efficient. Generous donor contributions recently funded the new equipment. The Systems Immunology Division collaborates with Institute scientists to provide the single-cell analysis with sophisticated equipment, detailed analysis and high throughput sequencing. Systems Immunology staff includes PhD computational biologists and biostatisticians with access to a high-performance computing infrastructure and specialized software. Systems Immunology collaborates with Institute scientific teams on single cell analysis. Here the teams discuss type 1 diabetes. From L to R - Janice Chen, research technician and Elisa Balmas, PhD, postdoctoral fellow, from the Cerosaletti Lab; Peter Linsley, PhD, systems immunology director and Virginia Muir, PhD, postdoctoral fellow, Linsley Lab and Karen Cerosaletti, PhD, principal investigator. 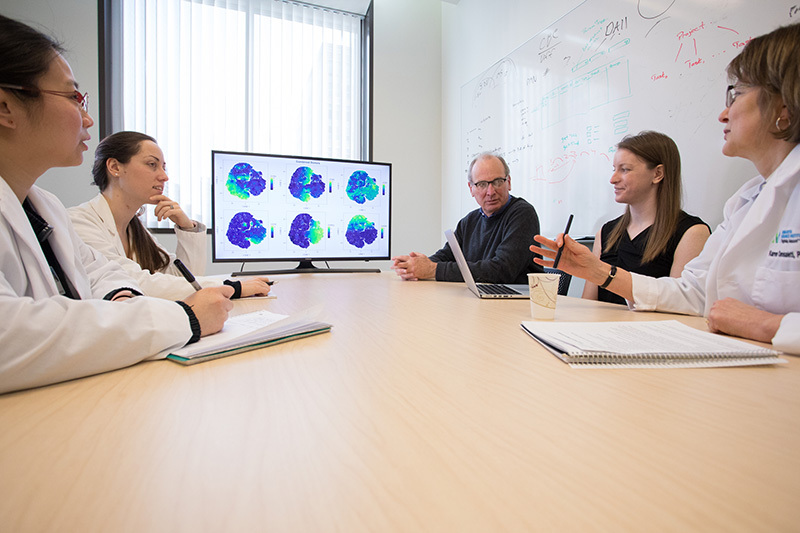 By using sophisticated technologies and data analytics that can read and interpret the molecular blueprints driving cell function, discoveries made in the BRI labs show the immune system differences that occur during health, disease or therapy. And with each discovery, when they find important pathways or cells, scientists then build model systems to test their theories to confirm the discovery has a critical role in immunity. Then, these pathways or cells can be targets for therapies to eliminate diseases and bring the immune system into balance again. Much of the equipment and technology used in these experiments are funded in part by generous donor support. People have also contributed to support for postdoctoral fellows and young scientists who are beginning their careers, such as when Dr. Wambre began his allergy studies. Community support is essential for these advances.